Chernobyl disaster induces to soul-searching, to reconsider comprehension of the universe, our values and a place of the person in the world. Just peculiarities of world view and values system determine different cultures of various epochs and regions, for example, the culture of the West and the Orient, the culture of the Ancient World or the present-day culture. Chernobyl has affected the key cultural aspects, therefore we probably undergo a turning point in the history. It is obvious that art cannot stand aside this process. There is a good reason to speak about Chernobyl as a work of art, although the work signed with minus. 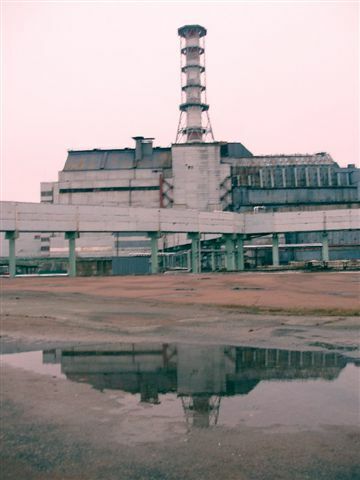 Chernobyl is a phenomenon which has much in common with a work of art. Chernobyl became a sign, a type, and a multifaced image. Namely these moments are perhaps the basic indications of work of art as a cultural phenomenon. The localization or even originality of its headstreams and, at the same time, loss of national limits, and also getting world-wide sounding make Chernobyl related with a work of art too. Origins of Chernobyl have roots restricted with definite cultural and even cult (ideological) frames inherent to Soviet community of that time. Meanwhile, Chernobyl is no longer a confined phenomenon; it became the phenomenon of global scale and significance. There is a curved space around of Chernobyl, which is in fact "a creature of reason sleep". All kind of spaces are curved there: financial, political, legal, intellectual, mental and moral ones. Course of all sorts of processes and flow of time are changed there. Obviously, Chernobyl time is extended for ever; the creation under the name Chernobyl can live very long. The task of the artists is to see the Sublime in this grandiose work of art, exhibited on the universal arena, and to transfer this to usual show-rooms, galleries, museums. Each artist chooses his own creative foreshortening, and from the selected position, with allowance for his own sight and means, he reproduces the artistic image. Each of such images invokes to remind that Chernobyl is a warning and admonition; it is a lesson of history which cannot be neglected and forgotten. The artists of "Strontium - 90" art group within the framework of the project "Chernobyl. Between the past and the future" exhibit not only colorful canvas. They tell also stories about the first day of the post-Chernobyl era, i.e. April, 26, 1986. Each of them had own memoirs, impressions and experiences concerned with this day. At that time they were living in different places and even had not supposed existence of one another. But Chernobyl joined them invisibly just that day. Then all people found themselves bounded with the disaster which has brought mankind attention to the question about their rationality and a further development of the civilization. Today, 20 years later, all of us is still staying at the cross-roads between the past and the future; between the past given rise to the world worst nuclear catastrophe, and the future which depends on today's choice of humankind. On this way from the past to the future Chernobyl is still with us.